This is a delicious option – light, healthy and nutritious. Turn this recipe into a Meat curry by adding some leftover chicken or lamb. Heat a large pot with a little oil, add in the onion, thyme and garlic and sweat gently for 3-4 minutes until softened. Add the leeks, carrots, celery, mushrooms and potato and continue to cook gently for a few minutes. Next add the flour and the curry powder and stir gently, ensuring that all of the vegetables are coated with the spice mixture. Next pour in the stock and allow the mixture to come to the boil. Reduce the heat and simmer for 10-12 minutes allowing the vegetables to cook through. Add in the broccoli, raisins and natural yogurt and continue to cook for a further 6-7 minutes over a low heat until the broccoli is just tender. Cook the rice according to packet instructions and serve immediately with the curry. Feel free to use whatever vegetables you like in this recipe. I would often add in mixed peppers, courgette or cauliflower. 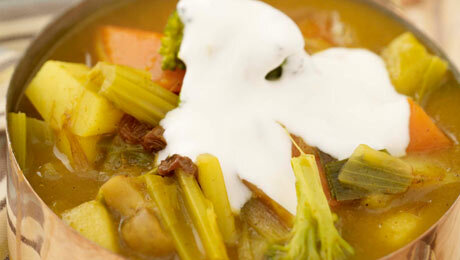 If you prefer the curry with a more ‘sauce like’ consistency add extra yoghurt, stock or even canned coconut milk.